About 2 hours outside Sao Paulo is a town called Socorro. Adventure tourism is a central part of the economy there and Parque dos Sonhos (Park of Dreams) plays a leading role. Among the activities adapted for people with disabilities are rafting, inner tubing, rappelling, canopy walks, off-roading and zip lines. The top-of-class zip line ("tirolesa" in Portuguese) is called Tirolesa de Panico (The Panic Zip Line!). It runs almost 1 kilometer in the air, over a river, buildings -- and the edge of a very steep rock. Here I am after the 50-second / 1 km aerial trip. 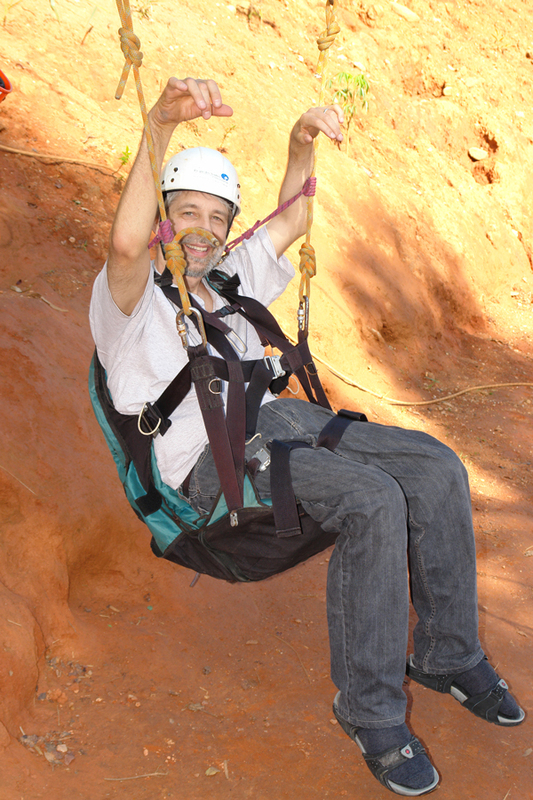 In this photo I am modeling the modified ultralight seating that is used for quadriplegics on this two-cable zip line. A fuller report and photos from REATECH will have to wait for faster Internet connections but meanwhile progress continues in other parts of the world. Here is an example of what Svayam is doing in India? Jallianwala Bagh, a historical landmark in the Indian freedom struggle, is set be accessible to all with Svayam, an initiative of the Sminu Jindal Charitable Trust committed towards making public infrastructure accessible to persons with reduced mobility, and the India Tourism Development Corporation (ITDC) today announced a unique initiative ahead of the occasion of “World Heritage Day” and commemoration of its 89th anniversary. “Svayam has undertaken an access audit and come out with a set of recommendations for providing and ensuring accessibility to the Jallianwala Bagh complex. The audit has been forwarded to the ITDC, Abha Negi, director, Svayam, said here today. REATECH in Sao Paulo is truly the largest disability expo I have ever attended. The Cape Cod Disability Access Directory is a project of CapeAbilities. Continue reading Publishing Disability Directories as a Revenue Source: CapeAbilities. Regular Internet access has been difficult to arrange while on the road. Craig Grimes of Accessible Barcelona and Accessible Nicaragua and I have met up. He has been more successful n posting to his blog. Read his humorous entre, Corte Cabelo, for a glimpse of the trip. Field trips include a site visit to the town of Socorro and another to Brotas. Both specialize in adventure tourism with siginificant investment and growing vendor eexperience in adaptied outdoor sports. The Socorro experience will incude a zip line (zip wire; tirolesa) that is one kilometer long - plenty of time for second thoughts, Im sure! 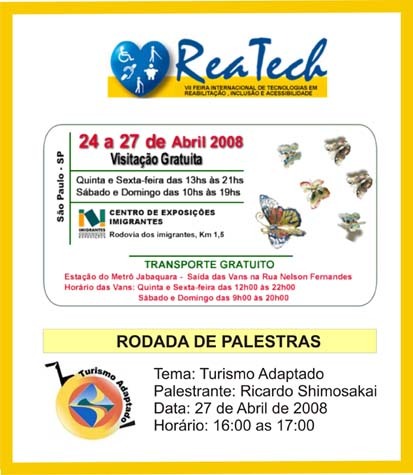 This week is Brazil's third national rehabilitation expo and disabbility arts celebration known as REATECH. The event runs April 24-28 and is held in the Centro de Exposi? ?es Imigrantes. This year promoters of inclusive tourism and adaptive sports and recreation are gathering to participate. Architect Silvana Serafina Cambiaghi of S?o Paulo will be speaking about her new book on Universal Design. Nelida Barbito of Buenos Aires will speak about her work with travelers with disabilities and retrofitting a hotel in Argentina. As previously reported, Ricardo Shimosakai will speak on the inclusive adventure tourism group Turismo Adaptado. Dada Moreira will speak on his adventure tour non-profit Aventura Especial. In addition, a Bloggers Summit will track the Expo from on site. Blogger and Inclusive Travel expert Craig Grimes has already begun blogging at his site Accessible Everything. I will also be blogging from the event and providing links back to these and other bloggers who cover the event. A public forum held by the Wellington City Council at Te Papa earlier this month was entitled “Tourism for All” and concentrated on a number of aspects around accessible tourism for people with disabilities (PWDs) and seniors. Wellington, New Zealand’s capital city, is probably the most proactive jurisdiction in the country when it comes to access tourism, and the forum, driven by the council’s Disability reference Group (DRG), was opened by Wellington mayor Kerry Prendergast. Guest speaker Sandra Rhodda from Tai Poutini Polytechnic in Greymouth said that the New Zealand tourism and hospitality industry ignores the boomer, senior, and access tourism market to its peril. Continue reading Wellington City Council and Tourism for All. It is with great satisfaction that I am writing to you, following public announcements made by your services that a proposal for a European directive fighting discrimination against disabled people will be proposed to the College of Commissioners at the end of June as part of a comprehensive ‘Social package’. This is the best response that you, together with Commissioner Vladimir ?pidla, could give to the ‘1million4disability’ campaign that EDF has led over last year, and that has gathered the support of over 1.364.984 citizens including prominent national and European politicians, representatives of a wide variety of civil society organizations, trade unions, and heads of State. It is also very significant as it is the first citizen’s initiative that is followed up by the European Commission, even before the entry into force of the Lisbon Treaty. All citizens will rejoice of your decision, as it sets a positive example of democratic dialogue between the European Commission and the people of Europe. Continue reading Open Letter to José Manuel Barroso from the European Disability Forum. Let's face it. For those of us with spinal cord injuries and many people with mobility impairments bathrooms and bodily processes come up more often in our conversations than is the national average. The Best Little Outhouse in Town! An award-winning universally designed public restroom outside Bangkok, Thailand. Madrid. (EFE).- Las personas sordas podrán comunicarse a través de una aplicación de videollamada on line de alta calidad que se ha presentado hoy por Skype y Logitech en la Asociación de Sordos de Madrid. Continue reading Skype presenta un servicio de videollamada para sordos (Spanish). The e-government Awards in the UK recognize innovation. Talking bus stops in the Brighton & Hove City Council Sustainable Transport system won the award in 2007. Continue reading Talking Bus Stops. This article from the Cape Cod Times explores disability and citizenship. You can read the whole article here. Every town on the Cape holds its town meeting in a location that at least meets the minimum standards to be accessible to voters who use wheelchairs. But town meeting venues aren't always so accommodating for those who are visually or hearing-impaired. The article goes on to document a lack of awareness of accessibility requirements by towns in the area. With financial pressures to save money this is not a hopeful sign. CATEA is pleased to join the International Council for Research and Innovation in Building (CIB),the National Research Council, and the Construction Technologies Institution in organizing the Working Commission 084 "Building Comfortable Environments for All" to be held at Georgia Tech's College of Architecture. * How research and innovation can be used to help all countries address current and future demands of building inclusive environments for all. Please contact Trin Intra at CATEA for more information about registration. The Global Universal Design Commission (GUDC) is a new non-profit organization that has been established to promote the adoption of universal design. It is modeled after the Green Building Council which has played an important role in increasing adoption of sustainable design practices in the building industry. Our intent is to address the need for greater usability in buildings in response to many social trends, e.g. the aging of society, globalization and social diversity. Our first activity will be to develop voluntary guidance standards for applying universal design to commercial buildings. These standards will complement existing accessibility standards and regulations. In fact, we expect that no building will receive an accreditation from the GUDC if it does not meet accessibility regulations as a basic requirement and thus, our work will improve compliance with access laws. Like the GBC's LEED standards, the UD Standards will provide a rating system to accredit buildings that address higher levels of usability than accessibility codes and include issues beyond their scope. The UD Standards will be flexible and allow each project to achieve accreditation in different ways in response to different conditions. Points will be awarded in different categories and there will be a graduated level of achievement based on a percentage of total points received. Neither the rating system nor the accreditation levels have been established, but work is underway on a preliminary draft that will be presented to the public at a kick-off meeting at the end of May. Attached is an announcement for that meeting. An open process will be used to develop the UD Standards, including the conceptual framework for the rating system and levels. The preliminary draft will simply be a point of departure. We welcome your involvement in this process and the new Commission and hope that you will be able to attend the kick-off meeting for the standards development project. *This activity is partially supported by the RERC on Universal Design and the Built Environment through funding from the National Institute on Disability and Rehabilitation Research. Continue reading Announcing the Global Universal Design Commission (GUDC). Reatech is a disability expo in Sao Paulo Brazil. This year there will be a significant contingent representing Inclusive tourism. Presenters on the topic will attend from the US, Argentina, Nicaragua, and throughout Brazil. Continue reading Reatech Disability Expo. There is quite furor spreading through the Philippines, Australia, and Southeast Asia about the treatment of deaf airline passengers and rightly so. It is the slippery slope phenomenon affecting those with mobility impairments, service animals, oxygen needs, and other human with the normal range of abilities that this species comes with. The Independent Living Institute Accessible Vacation Home Exchange service has been greatly improved. It is now possible for you to add, delete, and revise your own entry, as well as add photos. Swapping homes with other persons with similar needs, in other parts of the world, is a low-cost and practical alternative. You can find out in advance how accessible the vacation home is, since you can ask your swap partner relevant questions. And, unlike most other tourists, you’ll have an infrastructure of neighbors and local contacts in place as you arrive. As the number of visitors to the Independent Living Institute website continues to grow, so will the exposure of your offer to swap homes. Please take a look at www.independentliving.org/vacaswap.html and contact me, should you have any questions. "Ludwig van Beethoven (the famous deaf composer) would not be allowed to fly alone on a Tiger Airways flight if he were alive today, because of the Singapore-owned airline's purported policy on deaf passengers." A representative of Tiger Airways Australia told the group last month they could not make an interstate flight without a care provider who could hear. The group was allowed on the March 4 flight eventually, but was then sent a note by the flight attendant that they will not be allowed to fly alone on the airline again, the Herald Sun newspaper reported. Continue reading An Endemic Epidemic Gets the Media Coverge it Deserves. Parul Sharma in The Hindu on April 7th about improvement for travelers with disabilities using the New Delhi airport. What is not clear is whether or not these features arise from active participation by people with disabilities and their organizations (DPOs) or whether they are best guesses of the real needs of users provided by non-disabled "experts." The responsibility lies with disabled people of India to assure that it is the former and not the latter. It is a responsibility they carry on behalf of other communities of people with disability from around the world -- and not a light burden in the face of the huge infrastructure investment being made by India on airport upgrades. What the Indian disability community does today will be the legacy left to several generations in the future. This is the moment for it to step out on the international stage in a position of moral leadership and technical competence. Is the Indian disability community rising to the challenge? Continue reading Progress on Inclusion at Delhi Airport. I have not seen architect Ron Wickman 's project but if it can be described with the headline, "Signs of accessibility are subtle, lost in the style" then I am satisfied that it was a success. And it's sustainble because it will work throughout the lifespan of the owner. He gets it. We want style not sterility in barrier-free environments. It is the subtle details in his home that architect Ron Wickman likes to talk about -- the lowered light switches, raised electrical outlets, sloping walkway to his front door and wide, bright hallways. Those unobtrusive features make his stylish and attractive house a "universal" design, meaning it is accessible to disabled people and flexible in its uses. His focus was on accessibility and sustainability. So, in addition to the wider doorways and lowered door handles, the house is oriented toward the sun, its long, south wall filled with windows... He sees that flexible, universal design as a good fit with his other area of interest, sustainability. "Universal design is about sustainability. If I design a house that you don't have to modify in the future, then haven't I done something that's really sustainable." Continue reading Universally Welcoming: Signs of accessibility are subtle, lost in the style. Constructing a Tourist Exodus From Israel? As Israel braces itself for what the Tourism Ministry predicts will be the biggest summer for tourism in the state's 60-year history, activists for disabled rights are expressing anger over the lack of hotel facilities for those with special needs. And why is the demand low? Simple. They didn't build it so we didn't come. And who is "we"? Partly it is the 42 million Americans who spend $13.6 billion annually on travel. And why are these "special" rooms difficult to rent out to Temporarily Able-Bodied People? Because they were not built using Universal Design. They are merely made accessible - and that as an afterthought. The rooms are stigmatized as is the very language used. People with disabilities are not "special." They are customers. And they are going elsewhere. Continue reading Constructing a Tourist Exodus From Israel?. Accessible Escapes aims to provide a more compelling alternative to standard accessible travel options. Their goal is to share an authentic travel experience through getting to know the people, culture and landscape of every destination. They specialize in small groups and individualized attention, allowing clients to set the pace and, whenever possible, select the sites that best suit their needs and interests. Founders Jennifer Wittman and Loredana Caminiti personally visit and establish relationships in every city to which Accessible Escapes travels. The First National Conference on Accessible Transportation for Persons with Disabilities March 27-28, 2008 at the Great Eastern Hotel, Quezon City, Philippines. The objectives of the conference were "to promote transport accessibility as an entry point to building a non-handicapping environment for persons with disabilities."
? Developed common inter-sectoral understanding and dialogue on public transport and accessibility issues.
? Linked the call for accessible transportation to efforts on creating non-handicapping public transport facilities and physical environments.
? Identified the consideration needed for drawing an intervention plan for increasing inter-sectoral partnership for transport and accessibility issues.
? Recommended measures to address the identified gaps and issues in the public transportation system that limits the mobility of persons with disabilities resulted from the regional transport summits held in 2007.
? Drawn and formulated a National Plan of Action for an accessible public transportation system for persons with disabilities in the country. below is the conference Delaration of Support and Commitment. Continue reading Philippines: Access 2010 - First National Conference on Accessible Transportation for Persons with Disabilities. ...an orientation to any design process that starts with a responsibility to the experience of the user. It has a parallel in the green design movement that also offers a framework for design problem solving based on the core value of environmental responsibility. Universal Design and green design are comfortably two sides of the same coin but at different evolutionary stages. Green design focuses on environmental sustainability, Universal Design on social sustainability. In San Jose, First Community Housing's 35-unit Gish Apartments earned the LEED for Homes certification. The group serves transit-oriented families as well as those with developmental disabilities. "Green homes perform better than the average home," [LEED council spokeswoman Ashley] Katz said. "They're a healthier place to live with a smaller environmental footprint. It's like a tighter envelope." San Jose Mayor Chuck Reed, who offered up a green vision for the city last fall, attended Monday's ceremony. Afterward, he said his staff has started counting solar roofs in San Jose, and that fewer than 500 are now in place. His goal is 100,000 solar roofs in San Jose over the next 10 years. Sustainable and inclusive destination development works even in Silicon Valley. Continue reading Green & Inclusive: San Jose's Gish Apartments. 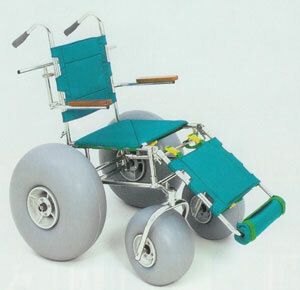 We often receive questions about beach wheelchairs. Locals and travelers alike would like to know where to rent one so that they can experience our majestic and famous coastline from the sand. The city of Santa Cruz currently does have a beach chair program, but it is very limited in certain aspects and they can only be used onsite at three beaches. In many instances, someone needs a beach wheelchair to attend a specific event (such as a wedding) or to visit an alternate site. There is no other place locally that rents them out, so we have not had anywhere to refer these many people. We are the ONLY place in Santa Cruz that offers a beach wheelchair available to rent on a daily (or weekly) basis! Continue reading Life on the Beach. Ecuador was the tipping point nation. This means that the document will attain force of law on May 3. "We recognize that many other states may consider the convention a useful tool as they develop their own national framework for persons with disabilities," said U.S. mission spokesman Richard Grenell. "But for the U.S., the Americans with Disabilities Act, passed in 2001, was the most sweeping legislation to provide access for people with disabilities." The momentum for justice on disability rights has bypassed the United States. Case in point, in practice the ADA does not provide the coherent and fundamental human rights affirmation on leisure and tourism contained in Chapter 30 of the Convention. Speaking to US readers explicitly for the moment - It is in our best interest as a nation to admit our failure to live up to our own promise as embodied in the ADA. It is time to join the international community rather than cower behind protests of having been "first." Protests of psuedo-support are a disingenuous disservice to the disability community. False assurances that the existing - and complacent - US system is the endpoint to be sought is also a disservice to business. Without a vision equivalent to that of Chapter 30 of the CRPD the tourism industry in the US will fall further and further behind the rest of the world. Continue reading ADA: US is Playing With Broken Toys. Mrs. Waterman, who wrote to Athens News (Letters to the Editor, 14 March 2008) is, of course, absolutely right. Her husband has a medical condition preventing him from climbing stairs. But when travelling on a Greek ferry they were initially refused access to the lift to take them from the car deck to the passenger decks, as Mr. Waterman does not have a disability permit nor does he use a wheelchair, both of which, they were told, are required by “The Regulations”. Only after a hefty argument were they allowed to take the lift, and then only with the unsettling message that this was an exception, not to be repeated. The regulations for carrying passengers in lifts may have made sense to the team of bureaucrats who penned them but in applying the rule in practice, common sense is thrown overboard, the ship’s captain becomes a sea monster and the fare-paying passengers have the prospect of experiencing what should be a delightful Mediterranean sea journey from the confines of the ship’s bilges. Continue reading Comment: Inclusive Access for Greek Citizens and Tourists. ...provides information about access to public places in New England for anyone who depends on a wheelchair, crutches, braces, a walker or a cane for mobility. The site, www.NEHandicap Access.com, which lists restaurants, parks, museums, stadiums, theaters and other public venues, has been up and running for only a few weeks. 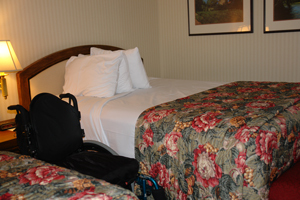 [Site owner Jerry] Biddle, who retired for medical reasons and uses a wheelchair, said his "epiphany" was a family vacation; while visiting his son in Connecticut, he and his wife booked a room at a nearby hotel that advertised itself as "accessible." "I couldn't get into the room," Biddle said. "I could get into the handicapped bathroom, but I couldn't get to the bed." Continue reading New Site for People with Disabilities on Public Spaces in New England That Handicap PwD. A special issue of the magazine Ethical has been published on Barrier-Free Tourism. The 13 page pdf download is available here. Launched on the first anniversary of the United Nations Convention on the Rights of Persons with Disabilities (CPRD), the Disability Rights Fund will provide financial support for human rights advocacy in the developing world and Eastern Europe/former Soviet Union. The broad objective of the Fund will be to empower disabled persons organizations around the world to effectively implement and monitor the CPRD. Continue reading International Coalition Launches Groundbreaking Disability Rights Fund. While ecotourism is still associated with the natural environment, there is now a sensitivity to the cultural dimension as well, and strong emphasis on engaging and involving the communities that surround very valued, high-quality cultural and natural resources. This is one of the challenges we have in the years ahead: we have more work to do in finding ways of tapping into tourism—which is really the largest ever transfer of wealth from rich to the poorer countries. ... is there potential for creating more business-related activities—such as tours, interpretation, facilities, or ecolodges—where consumers pay for services rendered and the money then sticks within the local communities in gateways near the protected areas? Can tourism be used to address the causes of conflict and war? What we really need is the freedom to travel anywhere we want in the world, and to be safe and secure. Freedom to travel, and safety and security, are probably the main concerns that people who live in these places are concerned about too. Then there’s the whole education side of travel. It is such an intensive opportunity to learn and gain practical exposure to the world. We certainly need more of that people-to-people contact in this day and age where there is so much conflict. Continue reading Donald Hawkins on Geotourism as Eco-Sensitive, Pro-Poor, Gender Fair, Peacemaking -- and Someday Inclusive.